As British chef and food advocate Jamie Oliver explains in the video above, our food culture has changed so drastically over the last 30 years, a majority of young children of today do not know what fresh, whole food is. They can’t identify foods, let alone figure out where they come from or how they grow. He shows how the three aspects of the “food landscape,” home, school, and main street, have all abandoned real food in favor of quick, cheap, processed foods. Three decades ago, the food available in each of these three areas was mostly fresh and grown locally. Now the majority of foods served, whether at home, in school or in restaurants, are highly processed foods, filled with sugars and chemical additives. During that same time, childhood obesity has more than tripled. Now, one in three children aged 10 to 17 is overweight or obese. If you feel inspired afterward to make some positive changes in your family's diet check out nourishedkitchen.com where you can sign up for the Real Food Challenge, designed to introduce newcomers to the principles behind a wholesome, nourishing diet and to reinvigorate the energy of those who’ve been practicing traditional foods for a while, you’ll meet your goals one day at a time throughout the entire month. Learn how to stock your pantry, how to source wholesome foods, how to reduce costs, hot to mitigate antinutrients naturally present in certain foods and how to improve your diet step-by-step through nourishing, real food. Simple as it is, the 28-day challenge is designed to walk you through a transition into real food one step at a time. A great way to keep children in touch with the foods they eat is to get them involved in gardening! My kids love to eat the foods they grow and it's amazing to me how many different types of things they will "graze" on in the garden that they wouldn't seek out in the kitchen or at the store. It makes my heart sing to see my little ones grab a fat cucumber off the vine and munch on it while they traipse around the yard. Even if they grow up and choose not to garden, at least they know how. And they know where real food comes from. Thanks for sharing the video. It's really sad how our food has evolved from being nutritional to being processed and empty. 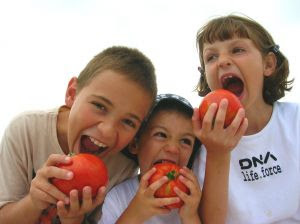 I strongly agree that to get kids to realized what real good food is, is by getting them involved in organic gardening. Hope many people will realize how important is this cause to our lives and our environment. Thank you so much for posting the video. I agree 100% with everything Jamie Oliver is working for. I eat healthier than when I was growing up as my mom/grandmother cooked every night & we had wonderful salads and vegetables, but we also had lots of fried meats! I do think kids eat better when there is a garden at home! Much more fun when you plant and pick your own food! !